Little Tot has been disappearing off to play hide and seek recently. Why? So he can try out the walking, taking Interactive Jo Jo. When we got Jo Jo from his box, and did the parent inspection of it, we thought "oh no, another noisy toy!" Lets face it, they drive us parents mad with their singing and squeaking. However, Jo Jo, whose premise is to find your child's hiding place by moving around the room, is just that little bit different. The rabbit is large, and cleverly maneuvers itself from place to place- it can cover wide distances, and chats away as it goes. If it bumps into furniture, it says "ouch" instantly, which Little Tot found hilarious. It also becomes upset if it thinks its getting colder (further away from the child) and excited if it thinks its getting warmer (nearer to the child). To start it off, it takes one switch to the front, which is big and chunky enough for little fingers to operate without parental supervision. It instantly comes to life, and sounds to a child like it can't wait to play with them. 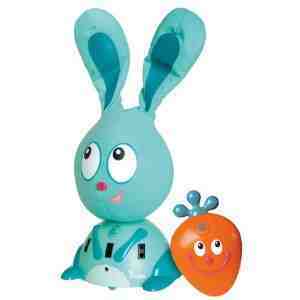 The large rabbit ears then flop mechanically over its eyes (which amazed Little Tot, with lots of Ohs being repeated!) and it encourages the child to go and hide. Jo Jo then counts to ten before attempting to find the child- and we've noticed how Little Tot is suddenly repeating the numbers with him, something which he was a bit stuck on until now. So, how does it manage to find the child? Well, included with the Jo Jo is a large cartoon plastic carrot, which has a belt clipper much the same as walkman's used to have, which contains a sensor. The toy then follows the sensor and to the child appears to have magically "found" them! This has become one of the Tot Tester's must popular discoveries ever, they will literally set the toy off and let it search for ages. I have been on occasion sitting in my computer chair, only to jump 3 feet by the rabbit hiding and telling me it was lost! It takes all the knocks it receives with grace too- it has been placed on coffee tables, dining tables and stairs, and when switched on has fallen off, only to be picked up and off it continues. In fact, such is Big Tot's amusement at its reaction to taking a knock that she has instigated quite a few herself. The rabbit meanwhile shows no signs of wear and tear. This is simply a great toy, it has kept Little Tot amused for literally hours, which I have never seen happen before even with cars. A very definite Family Panel Thumbs Up. This sounds fun! I'd play with it more I think, finding things I could "pin" the carrot on to! Simple things! !